The summer has flown right on by! We will squeeze in a couple more fun activities between now and Tuesday, the first day of school. For the last couple of weeks, though, our minds have been partly occupied with preparing for back-to-school. 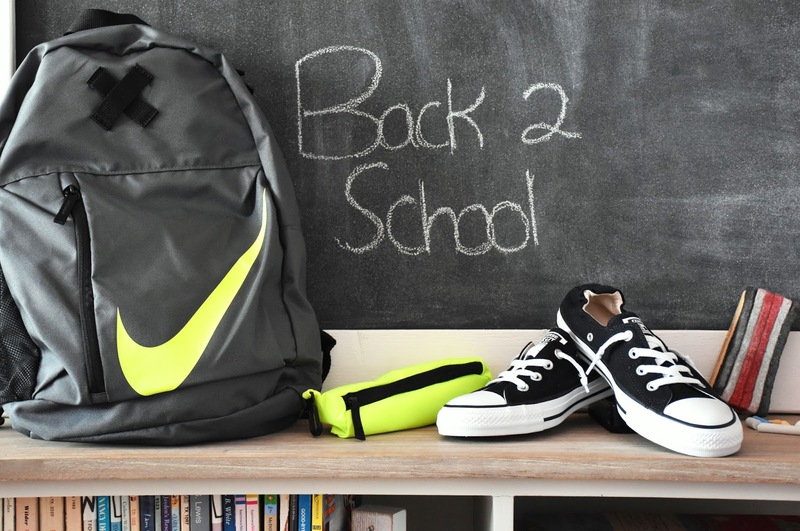 I'm sure many of you are in the same boat - squeezing out the last few drops of summer fun while thinking ahead to school supplies, clothing, backpacks and school lunch planning (always a stress, right?). My family had some help preparing for fall from two of our favourite stores - Canadian Tire and Sport Chek. Read on to see all the fab finds that are helping us to get organized and on track for back-to-school. As I said in this recent home office makeover post, prepping for back to school also means getting myself ready for a back-to-business work schedule. I have continued to write magazine articles and blog posts while the family has been home for the summer, but it has been a bit (a LOT) more challenging to focus. So September is going to be a productive time for me. I'll probably record a bunch of business receipts on my spreadsheet and do lots of blog and social media planning for the busy holiday season. To assist me with organizing my home office, I now have the CANVAS Evelyn 5-Shelf Bookcase from Canadian Tire. I have two bookcases on the other side of my office that house mainly books, but I wanted a smaller bookcase to hold storage boxes and supplies. 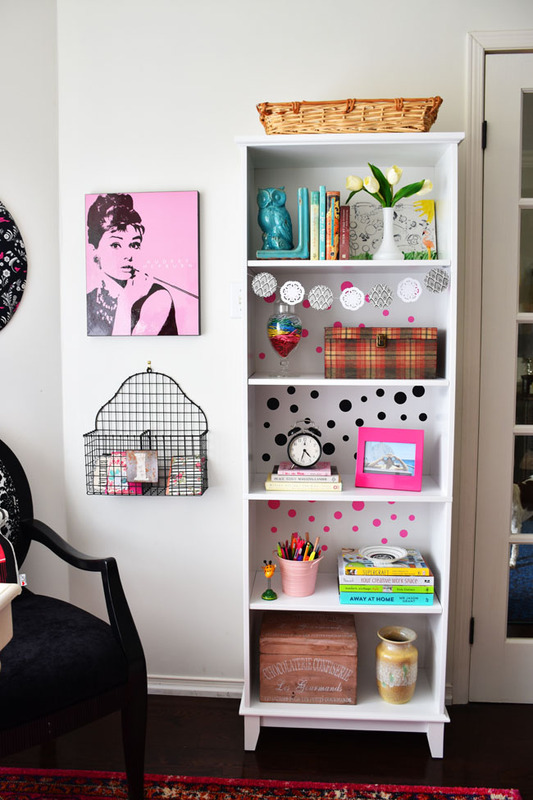 My home office has a black, white and pink colour scheme, with a few touches of teal. 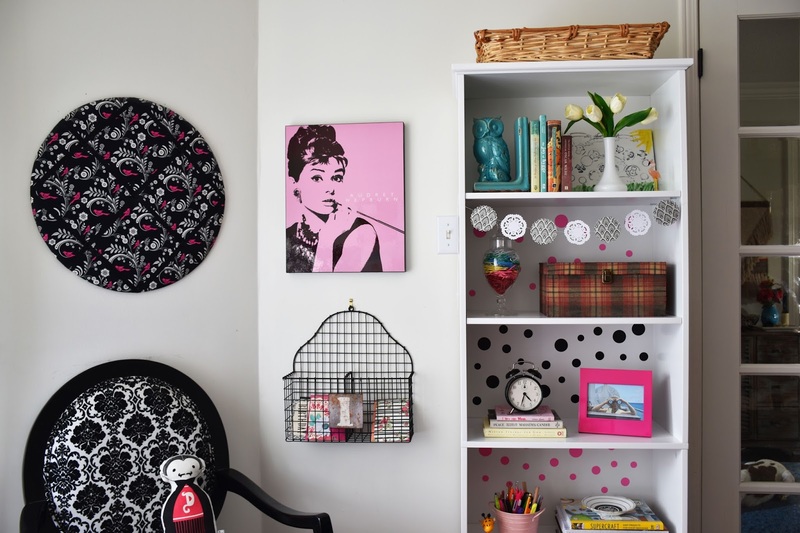 The Evelyn bookcase is white - it fits into the room nicely, however I decided to jazz it up with a black and white "lace" cardstock garland and a bunch of pink and black vinyl polka dot decals, all cut with my Cricut Explore Air™. 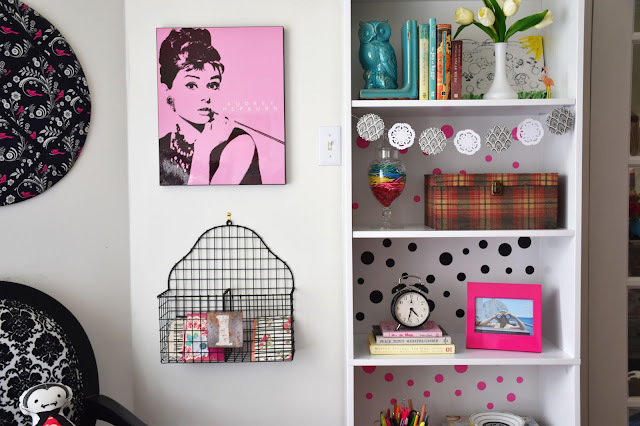 I feel like we parents tend to have fun with the decor in our kids' rooms, but how often do we create a fun space for ourselves? This little bookcase brings me a lot of cheer when I work. The plaid box houses my receipts and the "Les Gourmands" box at the bottom holds headphones. Pens, pencils and markers are out in the open in a pink tin bucket. I put colourful paperclips in a lidded glass jar. I placed a painted canvas that my kids created together when they were little on the top shelf. And I added a few books that give me inspiration. 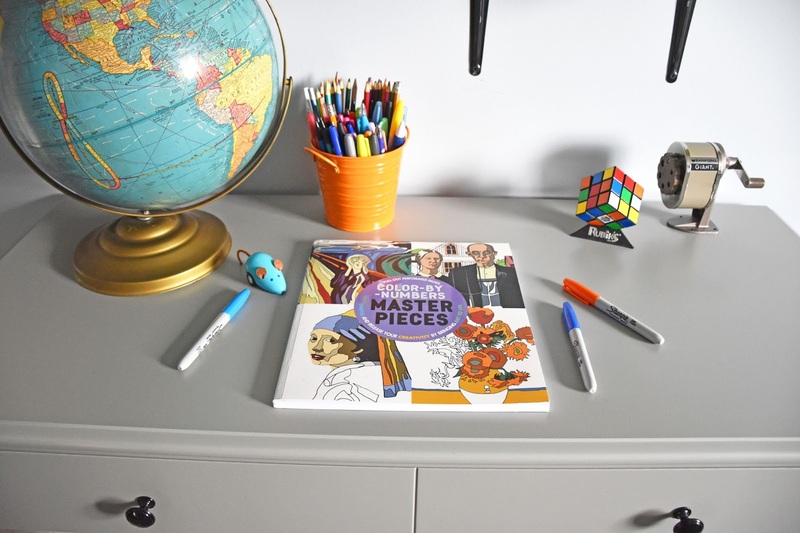 In preparation for my son's Grade 10 year and the added homework responsibilities it's sure to bring, we got this CANVAS Clara Desk for his bedroom. He had a green painted desk before, but when we re-painted his walls in blue-greys the desk looked really bad. 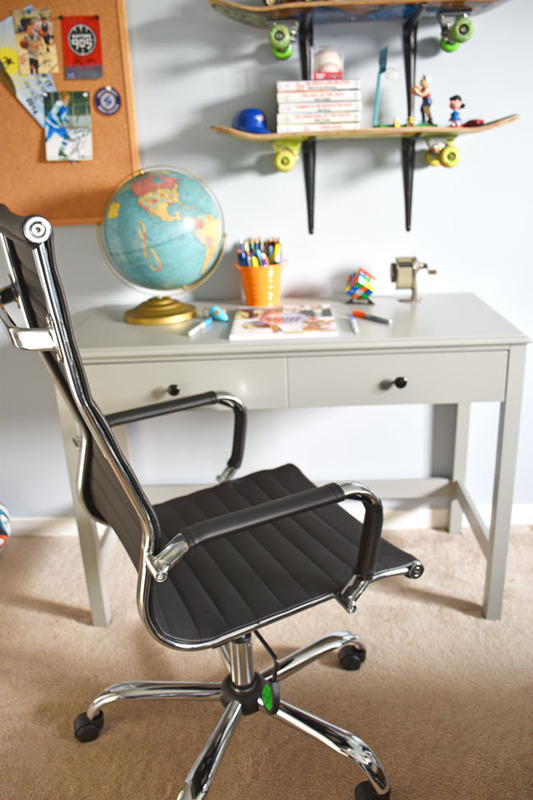 This grey Clara desk is petite enough to fit in his room, but still gives him plenty of space to do his homework (which he tends to do on a Samsung Chromebook). We kept his DIY skateboard shelves and cork board in place to hold mementos and vintage books and toys. 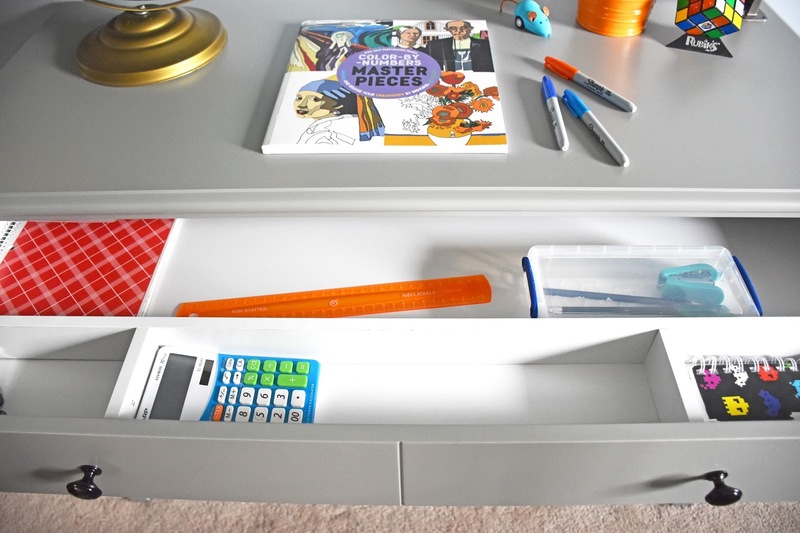 The Clara desk has a wide drawer with divided storage spaces, so it's handy for storing school supplies such as rulers, calculator, notebooks and markers. He could even put his Chromebook in there when he's not using it, to keep a clean writing or drawing space. My son also really needed a comfy chair for his desk. Canadian Tire came to the rescue with this CANVAS Parker Office Chair in black. The chair has adjustable height and tilt control, as well as padded arms, so it's nice and comfy. And it has a polyurethane finish and a chrome base so we can easily wipe it down now and then. Of course, when we think back-to-school, we think new clothes. That was about the only thing I looked forward to about going back to school as a child. My son actually wears a uniform, but he's been all about the new clothes lately (for the first time ever). It's a teenage thing I guess. He's out and about with his friends more on the weekends and they also have Civvies Days at school when they wear regular clothes. My kids are sporty (very unlike their mom as a teen I must say) and they love the clothes and shoes at Sport Chek. 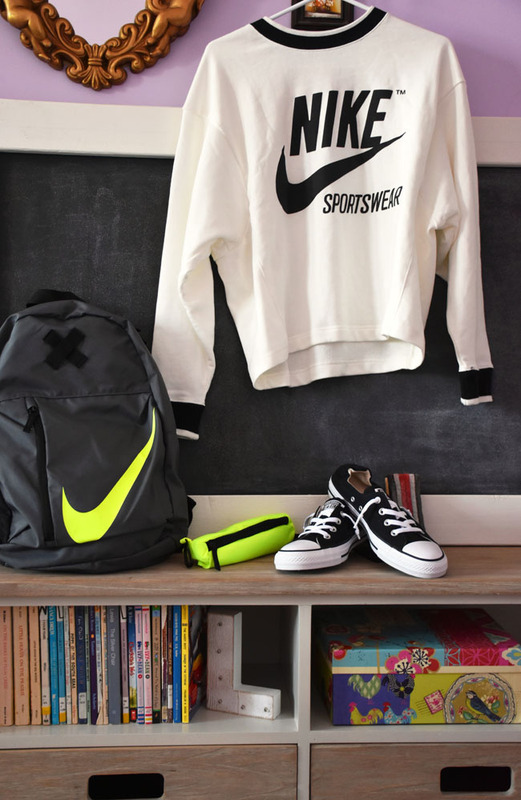 My daughter got this Nike sweater and backpack, as well as a pair of Converse women's black sneakers. They are a classic shoe, and, while I have several different colours and patterns of Converse shoes, I now want the black for myself too, haha. She has been wearing these comfy Nike stretch leggings since she got them - like every day. So much for back-to-school clothes. She also wears the Fitbit Flex 2 Fitness Tracker to track things like her steps taken each day, calories burned and distance travelled. 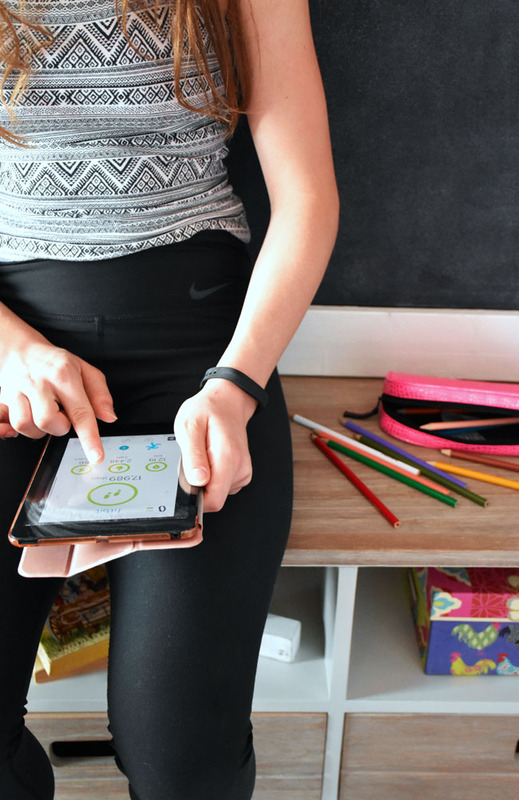 The Fitbit syncs the stats wirelessly to her iPad. You can also set the LED display on the armband to light up when you get calls and texts. And the Flex 2 is water resistant to 50 metres. It will be interesting to see how her fitness stats change when she returns to school. She might have to walk home from school to increase her steps! My son got lots of goodies from Sport Chek to wear on Civvies Days and weekend outings, including (clockwise from top): Adidas tee, The North Face Harway vest in black, Converse Men's Chuck Taylor Ox shoes in white, Nike Lunch Duffel, Quiksilver Fun Days men's twill pants in dark green and a Parkland Vintage Backpack. We also got him new uniform pants yesterday because he currently grows about an inch higher every month. Okay, maybe I'm exaggerating...a little bit. What do you have left on your back-to-school to-do list? Love these rooms and how you styled them! You certainly know how to choose things and put them together. Great ideas. Black and white with a touch of pink...your office speaks to me (especially the Audrey Hepburn print). Everything is organized but not to minimalist that there isn't tons of stuff to be visually interesting. My favorite feature is the skateboard shelves in your son's room...way to think outside of the box. great stuff! I love your colour scheme and these additions from Canadian Tire look great and will be so functional as well. I have a teen daughter too; we love Adidas wear. I think it is cool how it is coming back in style. Remember Adidas bags when we were young, and how popular they were? (I am probably older than you :) ) thanks for the great post! it is very motivating! 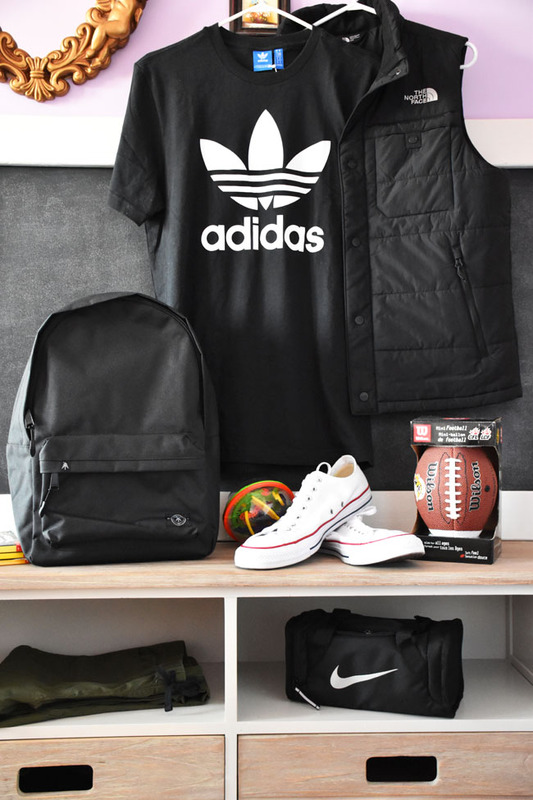 Certainly some great items for back to School,i love the backpack ! I love the room! I especialy like the skatboard shelves! Love the styling of your bookshelf area. It's functional and feminine! I love fall and the new beginning of school and activities. I really have tried to organize myself and my house. I love the CANVAS Clara Desk it looks like just the right size for a bedroom desk. I really like the Clara desk. It is a sleek and classic design, but also really functional with that divided drawer. I'm going to keep it in mind the next time I need a desk. I like what you did with the bookcase for your room, your correct we do everything for our kids and very little for ourselves. Love the background of black pocka dots. I did not know that the fitbit flex 2 also would notify you if you have a text message. I have a fitbit one and I love it.